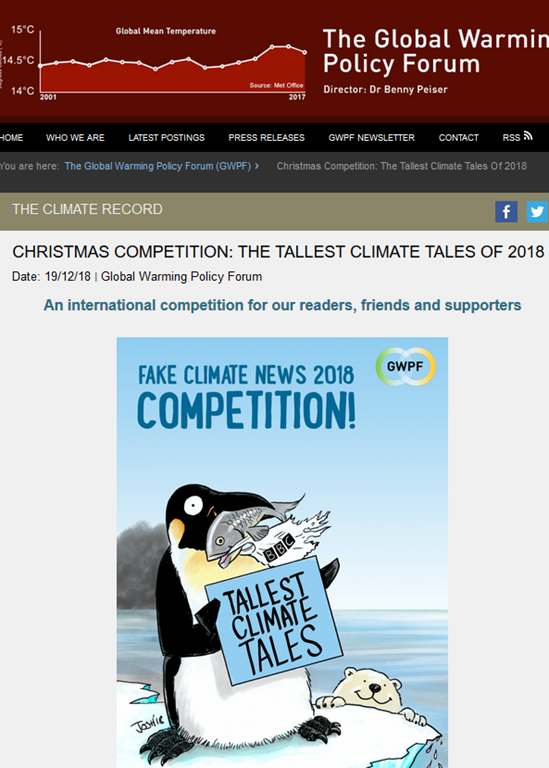 We at the Global Warming Policy Forum like to keep a close eye on what the press and the broadcast media have to say about global warming science. Some of it is, it’s fair to say, pretty far removed from anything a reasonable person would recognise as, well, science. We had a very apt example, just this week, with the BBC caught making up spurious “facts” about penguins in Africa. With the season of goodwill and merriment upon us, we thought it would be fun to celebrate the dedicated work of our friends in green public relations. We are therefore inviting you to take part in our special competition, with a chance to win some excellent prizes. Simply tell us about what you think was the tallest green tale of 2018, and explain to us why it was so daft. Prize: Two GWPF books (Group Think and Population Bombed) plus a bottle of House of Lords whisky. The GWPF team will decide the winner of the competition early in in the new year. Runners up will receive a bottle of Chateau Homewood mention on Notalotofpeopleknowthat. ← Where Did The Money Go?